Mya (left) and Deanna Cook served multiple detentions for wearing hair extensions at Mystic Valley Regional Charter School. 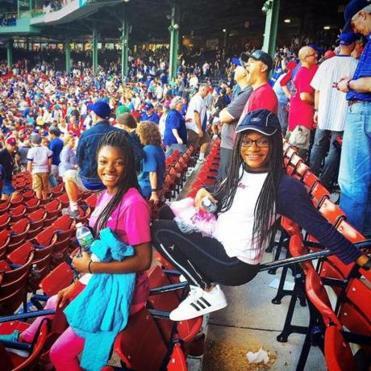 A Malden charter school that drew a rebuke from the state attorney general for punishing black and biracial students who wore hairstyles the school said violated its dress code has quietly done away with the controversial rules in its new student handbook. The handbook sent to parents Friday from Mystic Valley Regional Charter School no longer bans hair extensions, hair that is more than 2 inches in thickness or height, or shaved sides — rules Attorney General Maura Healey in May deemed discriminatory against people of color and unevenly enforced. 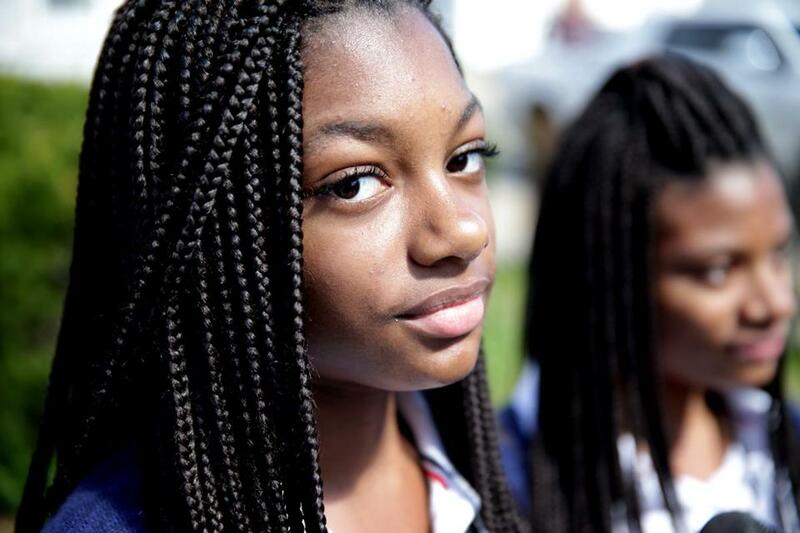 Black female students who wore extensions braided into their hair said they had been subjected to detentions and suspensions while other students who colored their hair — also prohibited under the old rules — were not singled out for punishment nearly as often. The new rules do away with the ban on hair coloring, too. Aaron and Colleen Cook, whose twin 16-year-old daughters, Deanna and Mya, attend Mystic Valley and served multiple detentions for wearing hair extensions, said they are pleased the school backed down for the sake of all students. But they said serious concerns remain. State data for the 2016-17 school year show that while nearly half of Mystic Valley’s 1,500 students are people of color, the school’s teaching and administrative staffs are overwhelmingly white, with just one black person, six of Hispanic origin, and three of Asian origin. In May, shortly after Mystic Valley’s hair policy erupted in controversy, the school’s trustees voted to suspend the rules and work with the attorney general’s office on a new dress code. Healey’s office continues to work with the school to reach a resolution on other concerns that have been raised but declined to elaborate. The lawyers also are asking that the school expunge records of all students, including the Cook twins, who received detentions, suspensions, and other punishments related to the hair policy. “Students should not face any consequences, academic or otherwise, for allegedly violating an unlawful policy to which they never should have been subjected,” said the letter, which was signed by the NAACP Legal Defense and Educational Fund, the ACLU of Massachusetts, the Lawyers’ Committee for Civil Rights and Economic Justice, and the Boston law firm Latham & Watkins. Three months ago, the lawyers filed a public records request with school administrators seeking documents to determine whether students of color were disproportionately targeted for punishment for alleged violations of the dress code. The lawyers said they are still waiting for those documents. “We hope this resolves itself as expeditiously and as thoroughly as possible, so that all children can start the school year without any fear of their education being disrupted by these polices,” said Matt Cregor, education project director with the Lawyers’ Committee for Civil Rights and Economic Justice. The new school year begins at Mystic Valley in less than two weeks.